USB Drive Recovery Software restores lost or deleted songs, pictures, word documents, photos, audio file, video file and all other types of files, folders and directory from formatted and logically crashed USB Pen Drive storage media. File rescue software supports data recovery even before you repair your corrupted storage device or sends to any data recovery specialist. 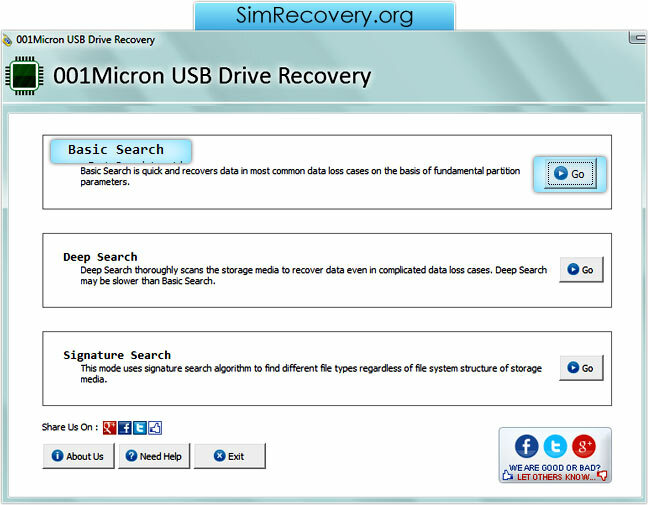 Flash drive data recovery software retrieves data even if USB device Volume is not recognized by your system or “Drive not detected” message is displayed while accessing digital media on your Desktop or Laptop computer. USB drive data recovery software is easy to use utility which can be operated by non-technical users. Supported Media Devices - Memory stick (Pro & Duo), Flash Pen drives, Jump drive, Disk-on-key, Jet flash, USB drive, Thumb drive etc. Supported Brands of Memory Stick - Pretec, Transcend, Kingston, SanDisk, Olympus, Lexar, PQI, Toshiba, Apacer, Sony etc. Supported Size of Storage Media - 64MB, 128MB, 256MB, 512MB, 1GB, 2GB, 4GB, 8GB and even higher capacity drives. User Interface - Graphical user interfaces assist user to understand the working of the file recovery software in easy way.